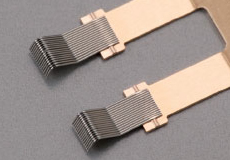 Multi-wire brush contacts have a multi-point contact structure which consists of fine wires in parallel bunches and provides high contact reliability. 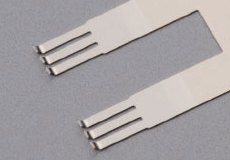 Multi-wire brush contacts can reliably read electrical signals from fine patterned circuits, thereby miniaturizing the product size. Scratch brush contacts, in combination with clad materials (see Precious Metal Clad Materials), use high-performance precious metal contact materials only in limited areas. There are various contact materials available with a high cost performance to suit various applications. 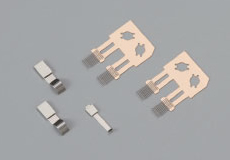 Various types of brush contacts are available in multiple contact shapes, from cost-effective standard products to advanced customized products. The contact area can be rounded to suit the product application. 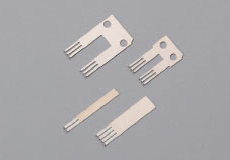 Various end shapes are available to fit the shape of the printed wiring board. Please contact us for further details. Potentiometers, trimmers, encoders, sensors for automotive use (throttle sensors, pedal sensors, vehicle height sensors, and sensors for exhaust gas recirculation (EGR) systems), etc. For other materials, please contact us for further details.